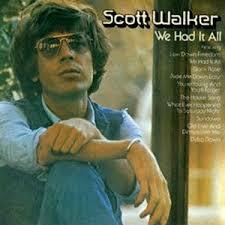 Scott Walker has amassed an impressive and highly respectable place in music. Yet his wilderness years- generally the first half of the seventies – are still awaiting proper analysis and evaluation and respect, not least from Walker himself. Many of the albums remain out of print, and even 1973’s Any Day Now, which may very well be the nadir, changes hands for around £60. Both as a member of the Walker Brothers and solo, he had had a number of hit singles and albums in the 1960s, was a teen heartthrob and had his own TV show. Yet by the early seventies much of this seemed ancient history. Sure, the music scene had changed, but was it simply that Walker was out of step? Walker still continued to record and release music, but he wasn’t bothering the charts, and nor pleasing the critics. There is speculation still that part of the chart failure started with the release Scott 4 under his birth name of Noel Scott Engel. The failure of the album led to the record company putting pressure on Walker: goodbye original compositions, hello cover versions. And not the likes of Jacques Brel, either. The baritone voice remained, but the material was sometimes questionable. We Had It All is actually a fairly solid album, though neither a critical or commercial success. He would reunite with the Walker Brothers the following year. Heard alongside the Walker Brothers’ next album, No Regrets, it starts to make sense. Granted, ‘The House Song’ is cringeworthy, the sort of country-lite that on its own makes this era of his career still fighting for redemption. Thankfully it’s buried halfway through the record. No less than four songs on the album were written by Billy Joe Shaver, the outlaw country singer, which had appeared the previous year on Waylon Jennings’ album Honky Tonk Heroes –‘Low Down Freedom’, ‘Black Rose,’ ‘Ride Me Down Easy’ and ‘Old Five and Dimers Like Me.’ Fitting Walker’s style of singing, the arrangements are far more Andy Williams or Frank Sinatra than an outlaw country singer. Walker’s version of The Eagles’ ‘Whatever Happened To Saturday Night’ has a vocal to put theirs to shame, but it’s the arrangement here is more Vegas than Southern California. The best track here may well be the title track – also on Honky Tonk Heroes. Yet whereas Jennings’ version is rather syrupy, Walker’s version, both in terms of arrangement and delivery is classic Walker, that can hold its own against his classic vocal performances of the sixties. As an album, then, it’s the best of Walker’s wilderness years records. It is still fairly easy to come by CD reissues from the late 1990s, when it is paired with Stretch, his previous album. Maybe Walker himself will come to terms with his lack of artistic input in these records and acknowledge that what feels like a trough for him would have been a pinnacle many singers could only dream of. Great piece Ed. Some of the covers Scott did during this period are absolutely fantastic – his version of ‘Ain’t No Sunshine’, which I only discovered this morning after your article inspired some Youtube digging, is fantastic.